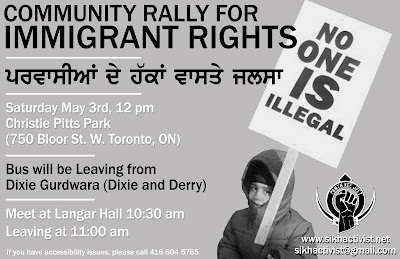 THE ROAD TO KHALISTAN: May Day of Action This Saturday! May Day of Action This Saturday! Vaheguru Jee Ka Khalsa! Vaheguru Jee Kee Fateh! This is a reminder for the May Day Of Action, Community Rally for Immigrant Rights, This SATURDAY, MAY 3rd. For those attending or interested in attending there is a FREE BUS leaving form Dixie Gurdwara (Dixie and Derry) at 10:30am. Prior to departure we will be meeting in the Langar Hall. The Rally will be starting off at Christie Pitts Park (750 Bloor Street West) and end with a community fair, musical performances, food, and much more. We would like to remind everyone that if there is enough interest shown from those attending Kaurs United Camp, the FREE BUS will also do pick-ups from Jot Parkash Gurdwara. After the rally is done, we will be joining the Maahan Youth Keertan Darbar @ Jot Parkash Gurughar. For More Information Please View The Attached Flyer. Or watch one of two videos, from last years demonstration! Millions across North America have taken to the streets in the last two years, demanding STATUS FOR ALL. In Toronto, workers, students, trade unionists, activists, and community members have led passionate demonstrations calling for justice and dignity for immigrants and refugees. We continue to fight against the Conservative government's ongoing attacks on migrant communities. The last year has seen unprecedented targeting of refugees in Sanctuary. Asylum seekers have been arrested from schools, workplaces and even hospital beds. Families have been torn apart. Over 12,000 friends, family, and community members have been deported. In the face of intimidation and fear, our communities have refused to be silenced. Together, we have forced immigration enforcement out of Toronto District schools. Inspired frontline community workers have taken up the struggle for Access Without Fear. We have fought and won a full Don't Ask Don't Tell policy at many community agencies. On May 3rd, we will take to the streets. We will demand an end to detentions and deportations. We will demand access without fear to essential services. We will demand an end to security certificates and secret trials. We will demand a full and inclusive regularization program. We will demand justice, dignity and respect! trials. We will demand a full and inclusive regularization program. We will demand justice, dignity and respect!